This project consisted of 3 buildings, The Civic Center, The Council Chambers and the Library. The Civic Center consisted of 6 bays with a wave feature on each side of each wave. The waves required custom curved aluminum and custom pattern glass to follow each wave. The Civic Center had a clerestory at the roof of each bay with vented windows and automatic operators for each window. The entire South Elevation of the Civic Center consisted of custom fabricated aluminum panels. The Library had several large areas of curtain walls with fly-by glass fins at each end. There were automatically operated vent windows were throughout the glazing system at this building. We also installed a custom automatic sliding door at the Library entrance. The Council Chambers had several ADA compliant automatic entrance storefront doors. 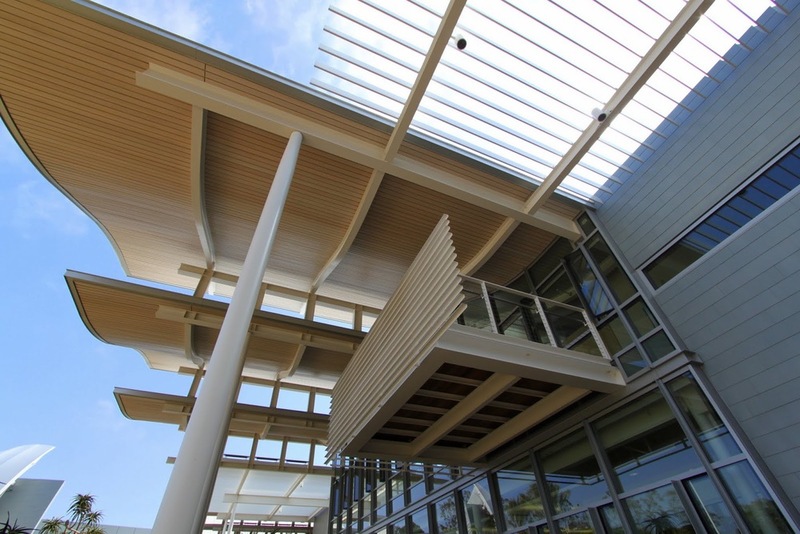 There were custom aluminum panels on the roof, main entrance, lobby and soffits of this building as well.